Mattel chose to throw fans a bone with their Dark Knight movie toys, by offering a line of 6" figures known as "Movie Masters." The line is eventually intended to feature realistic toys from all DC's movies, but right now they're focused on Batman. Of course, the distribution is spotty, and new releases are slow, which is why if you want a Dark Knight Two-Face, you have to settle for the smaller, simpler 5" version. 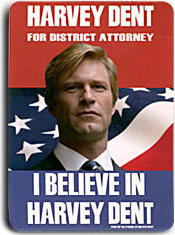 The citizens have voted Harvey Dent into the District Attorney's office, embracing him as their White Knight who will stand up against crime and corruption. As the various crime factions gain a stronghold over the city, Dent teams up with Lt. Jim Gordon to take the syndicate down. However, an outsider proves himself to be an overwhelming force to be reckoned with as he terrorizes the city, destroys lives and drives the crime fighters to their ethical limits. We normally tell you to steer clear of 5" movie toys, because they're generally terrible. Small, under-articulated, with soft sculpts and insipid action features, most movie toys are like most movie tie-in videogames: produced cheap and fast, with little thought given to anything except making both the street date and a fast buck off anyone foolish enough to buy the damn things. And let's be honest, Mattel's two Batman lines have done nothing to change any of that. rises above his origins. In part. The figure stands nearly 5½" tall, which would seem to point out how dumb it is for us to keep calling these "five inch" figures, but don't expect that to change. It's a handy modifier. Anyway, articulation is adequate, with swivels at the big five (plus waist), and hinges for the elbows and knees. None of the joints are hampered by action features, leaving us with a nice plain figure, so no complaints there. Rather than find an excuse to put Harvey in a garish two-tone suit, The Dark Knight made Two-Face's signature look a part of his origin: he was just wearing the same suit he was when he got scarred, and thus half of it is burned and tattered. The toy duplicates that, making the left side of his body rough and cracked, while the right side is still smooth. The halves are even painted differently, to help increase the separation. Yes, it may have been a bit too much, but consider it artistic license - the movie's was very slight, limited mainly to his shoulder and shirt collar. We talked before about how the 5" Joker's face had been toned down so as not to disturb parents, but amazingly, the same does not hold true for Two-Face. Other than a few missing paint apps, this toy has all the same detail as we saw in the movie: that means tendons, muscle tissue, bits of exposed bone, half-hollow nose... it's all here, and it's all hideous. Yes, it's painted flat purple, but this isn't some animated-style sneer and crazy hair, this is Aaron Eckhart's movie makeup on a children's toy. Even the likeness on the human side of his face is good! Harvey doesn't have any accessories, but there are a few pack-ins. This particular four figure assortment, which also includes two Batmen and a Joker, offers collector cards with each figure. 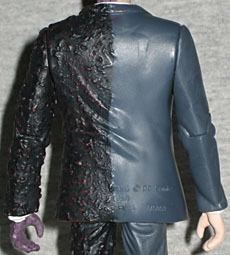 Two-Face includes an "I Believe in Harvey Dent" election image, which could double as a poster for the figure to stand in front of - it will even work for the upcoming Movie Masters Two-Face (and the unscarred Dent variant) - provided Mattel ever actually releases it. The "Coin Blast" part of his name comes from the other non-accessory, what the package identifies as a "'Blade'-Blasting Coin!" Yes, "Blade" is in quotation marks, for some reason. While the other three figures come with guns or what have you, there's no way for Two-Face to use this piece: no handles, no grips, nothing. It's a silver coin, 1¼" in diameter and ½" thick. One side has a woman's profile, while the other has an eagle. There's no denomination, and if it were truly meant to be Two-Face's coin, both sides would be heads. Press a button on the back, and ¼" blades pop out all around. Blurry pictures of this toy have been floating around since Toy Fair, but no one knew if the scarred half of his head would be "softened" to appease parents: only one person was able to get a surreptitious cellphone shot, and even that was immediately yanked down everywhere Mattel and Warner Bros could find it. Now that the figure has finally surfaced, shortly before the DVD release, we can see that nothing has been lost. Yes, the Movie Masters Two-Face will assuredly be better than this one, but for a 5"er, Coin Blast Two-Face is a decent offering. As Two-Face, Aaron Eckhart managed to hold his own next to Heath Ledger's otherwise-overwhelming (and let's be honest, Oscar-worthy) Joker, and right now this toy is the only way to recapture that.